John Voice born about 1889 in Guildford Surrey, The son of Edward Voice and Ellen Storr. Killed in WW1 he was a Private in King's Own (Royal Lancaster Regiment). Photograph courtesy of Eric Voice. 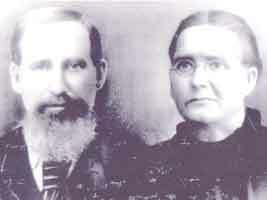 Cornelius Voice and his wife Elizabeth Smallwood. Cornelius was born on 01 Aug 1787 in Five Oakes, Billingshurst, Sussex. Cornelius and Elizabeth emigrated to Canada in 1834 on the ship British Tar with most of their children. They eventually settled in Illinois, USA. Peter Edward Voice born Billingshurst 7th Nov 1855, his wife Sophia Jane Andrews and their son Raymond Voice - born 10th Nov. 1889. Raymond Voice is our 5th cousin once removed. 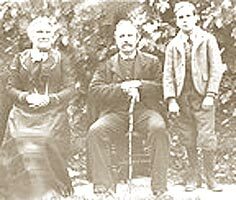 Edward & Ellen Voice.Edward was born in Cowfold and baptised in Billingshurst, Sussex on 8th May 1825. 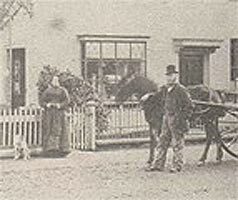 He maried Ellen Towse on 26 Dec 1853 in Billingshurst.